As part of us being a community club I suggested the club should organise a Christmas Foodbank collection to help those in our community who are less fortunate at Christmas. 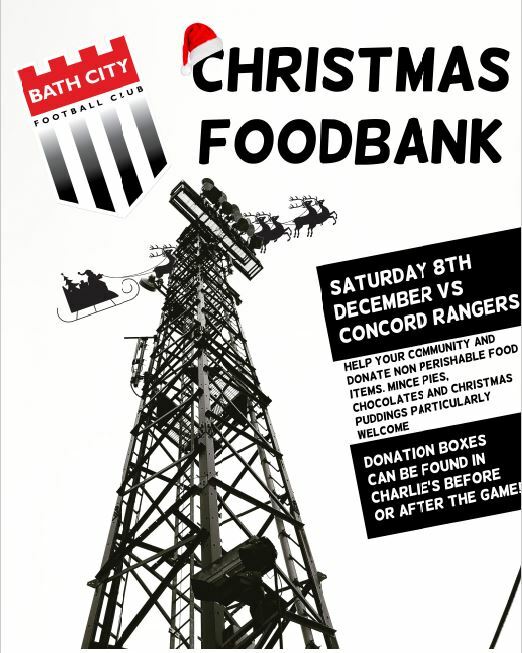 You may have seen the posters around Twerton Park at the Eastbourne game, but if you didn't, and to job the memories of people who did, we're collecting at home this Saturday (the Concord game) mince pies, Christmas puddings, chocolates etc., and they are currently in need of coffee (small jars), pasta sauce, sponge pudding & instant mash. If while doing your weekly shops you feel like sticking an extra item or two into your basket it would be gratefully received. Well done for raising the profile of this DESPARATE need.